For the second straight year, an RxSafe customer has won the Outstanding Adherence Practitioner Award from the National Community Pharmacists Association (NCPA). 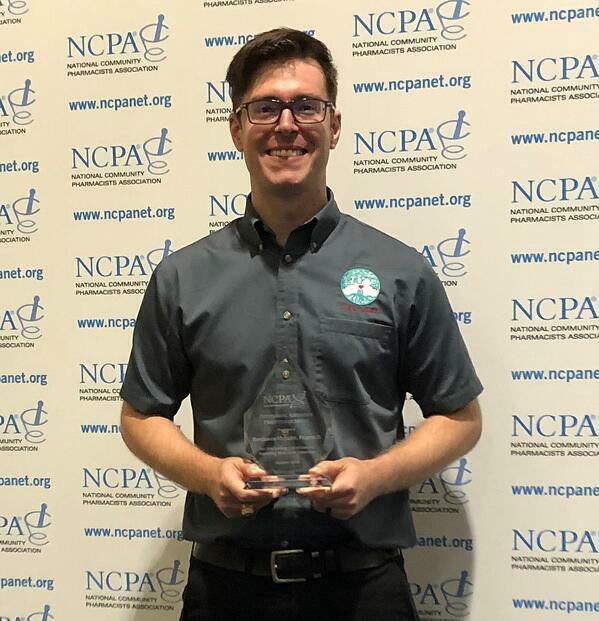 Dr. Benjamin McNabb, pharmacist and owner of Love Oak Pharmacy in Texas, received the award today at the NCPA 2018 20th Annual Convention in Boston. promotion of availability and value of pharmacy-based adherence services. McNabb has been an RxSafe customer since 2016, when he purchased an automated strip packaging system. McNabb’s success improving patient adherence at Love Oak Pharmacy is proven by the numbers. From a standing start with no existing adherence program, Ben grew his patient population using adherence packaging to 200 patients in 2016, and increased that by 100% to 400 patients by the end of 2017. Love Oak’s CMS star rating rose from three to five during that time. The 2017 winner of the NCPA’s Outstanding Adherence Practitioner Award was another RxSafe customer: Andrew Finney, PharmD, owner of Perkins Drugs in Tennessee. NCPA will make a donation of $1,000 to a school or college of pharmacy of McNabb’s choice. He received his PharmD from the University of Texas at Austin.